If you watched Descendants 2, then you are most likely super obsessed with Uma herself, China Anne McClain. She completely slayed her role as the new VK on the block out to get her revenge on Mal but if you're a loyal Disney Channel fan, then you know China is a DC veteran who is a total boss in every role. She's appeared on classics like Wizards of Waverly Place and Hannah Montana before snagging a lead role in the series A.N.T. Farm and in the Disney Channel Original Movie, How to Build a Better Boy. So yeah, at only 18 years old, she's a pretty big deal! Along with taking on Uma though, there's another part China is about to wow everyone with: her role as Jennifer Pierce in the upcoming CW series, Black Lightning. Oh and did we mention she's playing a superhero?! When we caught up with China, she couldn't help but gush over her next project in Black Lightning. The show is about a man named Jefferson Pierce, known as Black Lightning. He has powers that allow him to control electricity, but he gave up his life of fighting crime to protect his family, a wife and two daughters. Now though, he finds himself faced with the decision to bring back his superhero alter ego and one of his daughters discovers she has powers too. And as you can guess, that daughter is played by China. China explained to J-14 that playing Uma before she was cast as Jennifer actually helped her transform into this new character, despite that one role is a villain and the other is the complete opposite of a hero. "It's a totally different world! Black Lighting is one of DC Comics first African American superheroes to have his own comic book, so that is iconic by itself. I'm playing Jennifer Pierce, one of his daughters, and it's interesting because she finds out she has super powers as well. 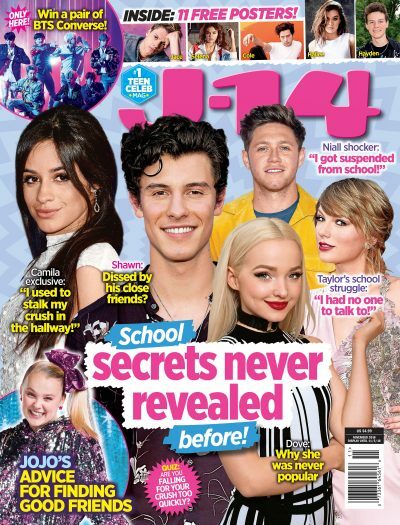 So she's kind of struggling with that, and she's also a teenager, so you know, she's going through stuff," China exclusively said to J-14. "But Uma definitely helped me tap into that same energy because to play a villain and it's on the opposite side of the coin, you need that power, you need that same energy. So it for sure helped, and it's just really cool to be able to play a superhero over here and a supervillain over there. I'm so excited!" OK, now is that not totally a dream to be able to call yourself a hero and a villain when it comes to an actor's TV and movie roles? China is out here literally making all our dreams, err we mean her dreams come true. Black Lightning is making its debut in 2018 and we'll just be here waiting.